It is important to remember that everybody’s experiences of labor are different; in the same way that everybody’s pregnancy is different. Your body will start to prepare for labor approximately 1 week before it is due to give birth. You may feel what are commonly known as ‘Braxton Hicks’ contractions. These are small contractions that can be described as menstrual type cramps. They occur when the cervix starts to thin and widen in preparation for labor. Some women may even begin to dilate up to 1cm during this time. You will notice closer to your due date that the baby is no longer sitting high up under your rib cage. He will drop lower into your pelvis ready for birthing. This will be a welcome relief for some, as breathing suddenly becomes a whole lot easier. Some women may notice in the days leading up towards the birth that you pass a small brownish coloured piece of mucus. This is called the ‘mucus plug’. Its job has been to plug the cervical canal for the 9 months. It will dislodge itself when the cervix starts to contract. You may get a sudden burst of energy, which causes you to race around and nest in the lead up to the birth. In the days leading up to labor your bowel is likely to open and empty, this can sometimes result in diarrhea. This is nature’s way of making way for baby. Some women will experience shivering and or trembling in the lead up to labor and or after labor. There is no need to panic. This is just nature’s way of reliving your body of tension. It is advised to remain calm, as each bout will usually last only for a few minutes. A warm shower and or slow deep breathing may help to calm the body. Your body will release hormones, which helps to loosen up the ligaments in the body and open up the pelvis. Most women will find that the stop gaining weight around the 1 week before they are due to give birth. Cramps and back pain is common. They are a result of your muscles and joints stretching and shifting in preparation for labor. How do I know if I am having a ‘true labor’ or a ‘false labor’? It will start with what will feel like menstrual type cramps. Eventually these cramps will turn into contractions. The contractions will start off weaker and will gradually increase in strength over a period of time. True contractions will start off short and will build up to last for longer periods of time. True contractions will be felt in the back first and may move around to the front of the abdomen. A true contraction is an intense pain and will take your breath away. Walking and or talking through it will be difficult. 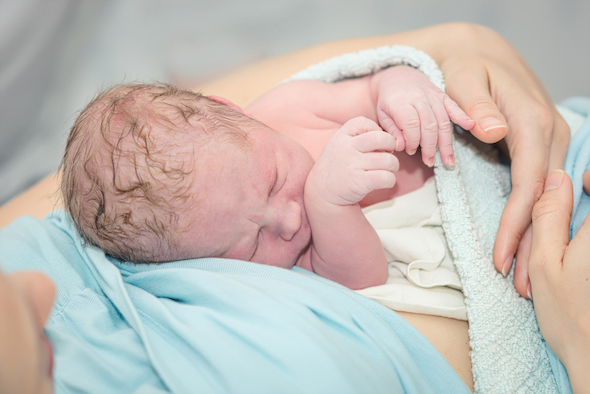 Women experiencing labor for the first time can often confuse false labor with the real deal. Contractions are not consistent and may come and go. The contractions do not worsen over time. The pain is not extreme and feels more like a bad menstrual pain. You are able to walk and talk through the pain. What happens if your water breaks and you do not have contractions? In the rare case that your water breaks and contractions do not follow, it is likely that you may need to be induced. The amniotic fluid sac that the baby has been living in for the past 9 months has been his protective seal. Once the water breaks, baby is exposed to germs and infection is possible. Should this happen to you it is advised to contact your health care provider immediately. Failure to do so could be detrimental to you and your baby. When should you call your midwife or doctor? If your water has broken. The can either come as a small trickle of water or as a gush of water. Trust your gut instinct. If you suspect something is wrong, don’t leave it. It is better to be safe than sorry. If baby is less active than normal. If you have any vaginal bleeding or unusual discharge. If your contraction start before 37 weeks. This is considered a premature birth. If you are experiencing blurred or double vision. It is advised to wait until you know for sure that you are in labor before going to the hospital, to avoid been turned away and being told to go home. Should you have any questions or concerns when at home, phone your mid-wife and or doctor first for assurance. Be very clear about your progress and the symptoms you are experiencing for an accurate assessment. If you are experiencing a normal labor with no complications, it is generally recommended to go to the hospital when your contractions are 5 minutes apart for at least 1 hour. Each contraction should last for approximately 30/70 seconds each. We would love for you to share your stories and experiences. When did you know you were in labor?